Think Burrus Blog: Corn Hybrid Selection: What's Important to You? What management decision can significantly increase corn bushels per acre, without increasing input costs? The answer is proper corn hybrid selection. When it comes to hybrid selection, the most important factor is yield. But, we have to remember that there is a difference between potential yield and actual yield. Perfect growing conditions can reflect the potential yield of a hybrid, but what about all of the possible environmental interactions that result in the actual yield of a hybrid? 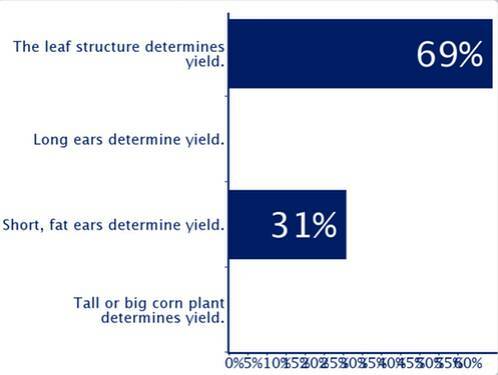 The audience at the Burrus Agronomic Symposium responded that yield was most important during hybrid selection. Unfortunately, there are many misconceptions on how a certain corn hybrid or set of genetics provides yield. Every corn hybrid has a different set of genetics, so they are not alike (like people)! 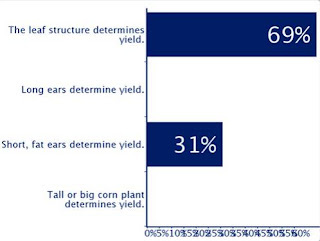 There is not one particular hybrid trait (like leaf structure, ear size, kernel attributes) that determines yield. Each hybrid has its own strategy, which consists of several hybrid attributes, to make yield, however, a hybrid must be placed and treated correctly to achieve this big yield. The audience at the Burrus Agronomic Symposium that leaf structure determined yield for all hybrids, when in reality, this is not true. 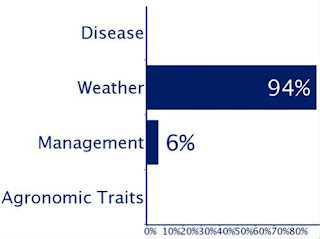 Weather is the number #1 factor that influences hybrid variability. Mother Nature also is problem because it interacts with other yield limiting factors such as disease, insects, loss of nitrogen, compaction, etc. Most of the audience at the Burrus Agronomic Symposium knew that weather was the #1 factor that affected hybrid variability. Since weather can cause so much hybrid variability, this is why we can't make hybrid decisions based on last year's plot, but should rely on results from multiple years and locations. Most in attendance at the Burrus Agronomic Symposium based their hybrid selection by looking at the top yielding hybrids over multiple environments. Since there can be hybrid variability due to weather, pests, disease, weeds, fertility, management, and other environmental factors, it is always good to help "spread your risk" when selecting high yielding hybrids. 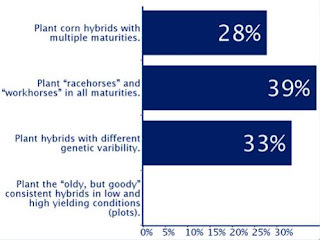 Some may choose an equal amount of corn hybrid "racehorses" and "workhorses". 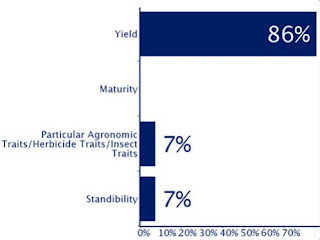 While others may spread out the maturity range of their hybrids to not only spread risk, but to also have wider harvest window or to balance yield with grain moisture. The key is to plant several different hybrids with different genetics. 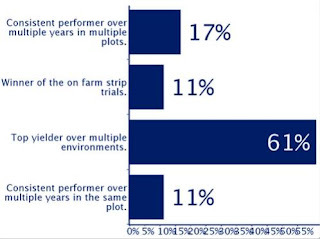 Here are some different ways that those in the audience at the Burrus Agronomic Symposium "spread their risk" when selecting high yielding corn hybrids. Let's face it, today there is more focus on physical, agronomic, and genetically modified traits, when the key is to properly match genetics to environment. Choose the best corn hybrid for your environment and then prioritize agronomic, insect, and herbicide traits as these can provide added insurance. Last, manage that particular hybrid for yield! Trust your seedsman or agronomist as well as previous field data to help you manage a certain set of genetics by telling you the correct population, response to fungicide, sensitivity to herbicide, need of insecticide, or response to nitrogen.